Dubai, United Arab Emirates, May 4th, 2015: Under the directives of H.H. Sheikh Maktoum Bin Mohammed Bin Rashid al Maktoum, Deputy Ruler of Dubai and President of the DIFC and as part of the initiatives of the Dispute Resolution Authority (DRA), the DIFC Courts today announced the launch of the DIFC Wills and Probate Registry, established by Resolution No. 4 of 2014, in the presence of prominent members of the Dubai community including the Head of Cassation of the Dubai Courts. The new service aims to provide non-Muslim expatriates the ability to register English language wills that will allow their assets to be transferred upon death according to their wishes. The new rules have been drafted on the basis of Common Law principles from the Estates Act and Probate Rules of the UK, and legislation of other leading common law jurisdictions such as Singapore and Malaysia. While the rules are comprehensive, they are also easily accessible to legal professionals in the UAE. The rules also reflect the spirit of UAE laws, which provide non-Muslims the right to choose the way in which their estates are distributed. A working group of Dubai based legal practitioners has been engaged with for the past year, to review and provide input into the draft Rules. The working group attorneys are as follows: Cynthia Trench (Trench & Associates), Diana Hamade (International Advocate Legal Services), Tasleem Sayani & James Berry (James Berry & Associates), Nita Maru, Leah Cimino and Victoria Perkins (The Wills Specialists – TWS Legal), Warren Luyt (Trident Trust), Andrew Lyons (Davidson & Co. Legal Consultants), Alastair Glover & Tim Casben (Wragge Lawrence Graham & Co.), Samir Kanaan (Kanaan Advocates and Legal Consultants), Mark Hoyle (King & Wood Mallesons LLP) , David Russell, QC (Outer Temple Chambers), Yann Mrazek (M/Advocates of Law), Shahram Safai & Stuart Walker-(Afridi & Angell Legal Consultants), Tim Denton, TEP (Abacus Financial Consultants), Stephen Cutts (ADIB Private Office), Sandy Shipton, Patrick Bourke (Norton Rose Fulbright), Tim Cartwright (Hawksford Group). The Registry has been established under the jurisdiction of the DIFC Courts, allowing it to operate as a distinct entity. DIFC Courts will handle all probate claims related to the registered wills. The service will only cover estates located in the Emirate of Dubai for both residents and non-residents. 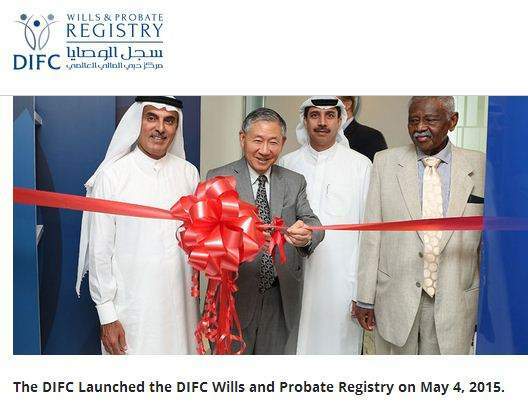 Registration appointments can be made online on the website:www.difcprobate.ae. With the introduction of this service, the DIFC will be the first jurisdiction in the MENA region where one can register an English language will under internationally-recognised common law, a system similar to those in Singapore and Malaysia.